Will South – South Trade Revolutionise the Global Economy? 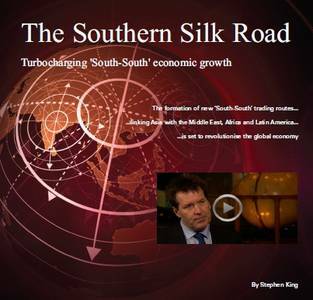 An HSBC report entitled “The Southern Silk Road, Turbocharging South-South economic growth” was released in June 2011; it has been influential in making the case for the growing importance of south – south trade. The report predicts that south – south trade will increase tenfold over the next forty years, and stimulate the world economy in the same way blossoming trade between the West after World War 2 helped drive high levels of economic growth in the second half of the 20th century. While the report concedes that the political obstacles are large and rivalries between countries such as India and China could derail the process, the economic imperative and rewards are massive if south-south trade does grow as rapidly as predicted. At the moment the growth of developing countries has been heavily dependent on exports to the developed world, think Chinese manufacturing, Indian software, Brazilian soya and Russian oil. Now the report claims that if developing countries dismantle trade barriers between each other, then trade and further economic growth will follow. In many respects these south- south linkages have already starting blooming, Chinese- African trade has been one of the major stories of recent years and Chinese trade with other developing parts of the world such as Latin America, has also boomed. Similarly Brazilian – African trade and investment has multiplied, but the figures are still dwarfed by north- south trade. The report gives an excellent example of this in action, the motor car, in the west cars have got bigger and more expensive as westerners get larger and increasing safety requirements have taken up more room and cost. Chinese and Indian car manufacturers keep their cars small and inexpensive in comparison. Chery a Chinese car manufacturer, now has 16 production centres in countries such as Russia, Ukraine, Egypt, Iran, Indonesia and Brazil. Chery is unknown in the west, but it’s cheap cars appeal to the middle income countries it manufactures in. The report argues that although the potential for an increase in south – south trade is there, the political will must also exist in order to break down trade barriers and tariffs, or as the report puts it “economic borders”. This in turn will be driven by the need for new markets to achieve further growth. China and other fast growing developing countries must diversify away from supplying US and European consumers, and look to new export markets. Recession, lack of growth and market saturation of inexpensive consumer goods in developed markets, limit room for further export growth. It is very much an open question whether these economic borders will fall, as developing countries have a raft of differences which could stymie this process, whereas the traditional western world; Western Europe, the USA and Japan had politically a great deal of common ground . Developing countries face different challenges, such as geo-political rivalry (China /India), or protectionism emanating from domestic constituencies, who may lose out in the reduction of trade barriers. Hand in hand with the political challenges are those of building physical infrastructure linkages, to handle greater volumes of trade, in many ways the developing world has made huge strides, the majority of the world’s biggest ports are in now in China or the developing world. Innovations such as the advent of super tankers, the internet, and cheap mobile telephony have brought down the costs of doing international business dramatically. A drastically altered international political scene over the last 20 years has helped; the demise of socialist/communist countries has given way to more liberally minded politics in developing countries broadly receptive to freer trade. Some of the proposed infrastructure projects in the developing world are massively ambitious and bolster the reports’ argument. The Chinese are planning a “dry panama canal” a railroad linking the Pacific to Atlantic, to increase capacity as the Panama Canal is at full capacity and remains under the facto control of the water canal. Sceptics have pointed to the fact the “wet” Panama Canal is being widened and moving freight across a railway would cost a lot more than a conventional canal. The Trans-Asian railway, an integrated freight railway from Xinjiang, China through Central Asia to Syria and Turkey, with routes through India and north to Russia giving landlocked countries access to ports. The expansion of Yangshan Port in Shanghai, already the world’s biggest port by some measures, but the 4th phase of expansion will raise the port’s capacity by 40% in 2015. This physical infrastructure will allow trade to expand, in the same networks such as railways, roads; canals and the net have improved the efficiency of trade and economies in the past. Following in the wake of physical infrastructure is the expansion of financial infrastructure. Huge increases in the rise and scope of developing world capital markets will surely follow in their wake, providing financial resources for expanding trade and investment. China’s lead in this can be seen in Africa already, the presence and investments of China Development Bank and EXIM Bank for example. Sovereign Wealth Funds from developing countries are also diversifying out of traditionally safe assets such as Treasury Bills to higher yielding assets in infrastructure, financial institutions and industry. Crucially the growth of developing world capital markets is going to be state driven, either directly or indirectly. State owned financial institutions from the Chinese EXIM bank to sovereign wealth funds are taking a key role in financial markets across the world. The HSBC report pointed to the British East Indian Company, as an early example of this. The Economist has just released a report on the growth of State Capitalism across the world. A crucial fact contained in the report is that 28 of the World’s developing world’s 100 biggest companies are state owned. Another point not raised in the report is that at some point the distinction between “developing countries” and developed countries will blur, especially if current growth predictions continue. Although it is obvious that per capita incomes in the west will remain higher for a lot longer, developing countries may soon have the economic weight to redefine the terms used by the west for so long. Previous Previous post: Why is Drug Consumption Rising in West Africa?